Projection visuals created for the Jeux de la Francophonie held in Côte d’Ivoire. To celebrate the 8th edition of the Francophone Games, I was invited by Circo de Bakuza to help create the visuals projected during this incredible event, which brought together 48 nations in a ceremonious showcase of arts and athleticism. 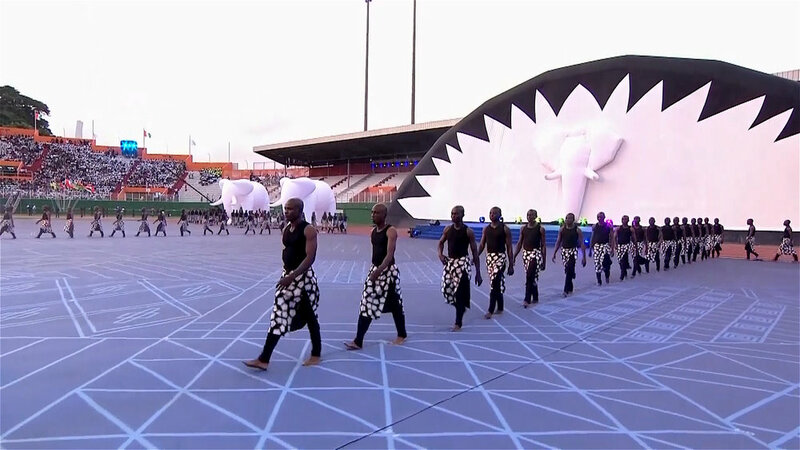 I designed and animated the visuals for the opening ceremony, as well as the background visuals for a musical performance by the Ivory Coast’s darling group: Magic System. Since the tusked elephant appears on the country’s coat of arms, its silhouette played an archetypal role in our storytelling and was literarily transformed into a 3D projection surface. We were so inspired by this culture’s use of colours and shapes that it was simply a no-brainer to give them a central role in our designs. In collaboration with Circo de Bakuza’s in-house team, we created a wide mix of traditional and contemporary patterns that lit up the night’s festivities! Big shout out to Circo de Bakuza for inviting me to collaborate on this inspirational project!